A San Francisco woman caught on video threatening to call the police on an 8-year-old African American girl is now facing a boycott of her cannabis business. Multiple marijuana dispensaries in the Bay Area have publicly denounced Alison Ettel, the founder of cannabis company TreatWell, after she was captured on video confronting her neighbor, Jordan, 8, for selling bottled water. The video was taken by the girl's mother, Erin Austin. The story went viral on Saturday after Austin filmed the exchange, saying she feared the situation might be racially motivated. Jordan is biracial and Ettel is white. "Calling the police on any person of color these days is an issue. They come, they shoot first and they ask questions later," Austin told "Good Morning America" Monday. "Knowing that and knowing everything that's going on in the media, why would you call the police on a child of color?" Ettel did not respond to ABC News' requests for comment via email, voicemail and text message. But she has publicly denied accusations of racism and has said she has gotten death threats since the video was posted. Ettel said her complaint stemmed from the fact that she was working from home and the noise bothered her. "I tried to be polite but I was stern," Ettel told NBC News’ "Today" in an interview. "And I said, 'Please, I'm trying to work. You're screaming. You're yelling, and people have open windows. It's a hot day. Can you please keep it down?'" She also released a statement expressing regret for her actions. "I have no problem with enterprising young women. I want to support that little girl. It was all the mother and just about being quiet," Ettel's statement read. "I had been putting up with this for hours, and I just snapped." As for calling the cops, Ettel claimed after the fact that she was only pretending to call. A spokesperson for the San Francisco Police Department, Robert Rueca, confirmed to ABC News that "there is no complaint nor do we have any record as to whether she called." "I completely regret that I handled that so poorly," Ettel said. "It was completely stress-related, and I should have never confronted her. That was a mistake, a complete mistake." Despite the apologies, both Ettel and TreatWell are facing a boycott and backlash. One dispensary, Berkeley Patients Group, posted on its Facebook page that it will "no longer carry" TreatWell's tinctures, concentrated medicinal extracts in bottles with rubber droppers. TreatWell makes cannabis products for people and pets. Alison Ettel apologized after a video of her calling the police on a young girl selling bottled water in San Francisco went viral. Instead, Berkeley Patients Group vowed to donate profits "from their "remaining inventory to Cinnamongirl Inc, an Oakland-based mentoring organization for ambitious girls of color." Oakland, California-based Magnolia Wellness also called out Ettel's "tone-deafness" and announced it would end its relationship with TreatWell. "Treatwell has been one of the top sellers at Magnolia for some time," read a statement posted on their Facebook page. "A decision was made to immediately stop selling this product. We are going to replace it with some equally effective tinctures." San Francisco-based SPARC dispensaries also stated publicly that they are done doing business with TreatWell. "Effective immediately, we have ceased our relationship with Treatwell and will no longer sell their products," the dispensary tweeted on Monday. The video was posted on social media by Jordan's aunt on Saturday with the hashtag: "#PermitPatty" -- a clear nod to a similar situation back in April where a white woman in Oakland, California called the police on a black family barbecuing legally in a public park. That woman was dubbed #BbqBecky. In the few seconds of footage, Austin speaks into the phone as she walks up to Ettel, who can be seen holding her cell phone and squatting behind a cement wall. "She's calling the police on a little 8-year-old girl selling water," Austin is heard saying as nears Ettel. "You can hide all you want -- the whole world is gonna see you, boo." Ettel stands up and talks into the phone saying, "Yeah, illegally selling water without a permit." Austin counters, "On my property." Ettel responds, "It's not your property." On "GMA" Monday, Jordan said that she hoped to sell enough water bottles to fund a trip to Disneyland. The girl said that she and her mom had been pulling bottles from a cooler nearby for about 15 minutes when Ettel approached, "saying she was trying to work and we were being too loud." "I did not want to see the police because I was scared," Jordan told "GMA." Jordan said that she is convinced that Ettel, who is white, was motivated by greed and racism "because I think she doesn’t care about people's skin colors, because she doesn't care about people's lives except for hers." The fallout since the video surfaced and spread like wildfire online has also found critics chiming in on TreatWell's Yelp! page. "Don't go here and buy from a racist owner! Get out of our city and put your business elsewhere. WE DONT TOLERATE RACIST!!!! #permitpatty," Yelp user Kristine C. wrote. "Don't go here and buy from a racist owner! Get out of our city and put your business elsewhere . WE DONT TOLERATE RACIST!!!! 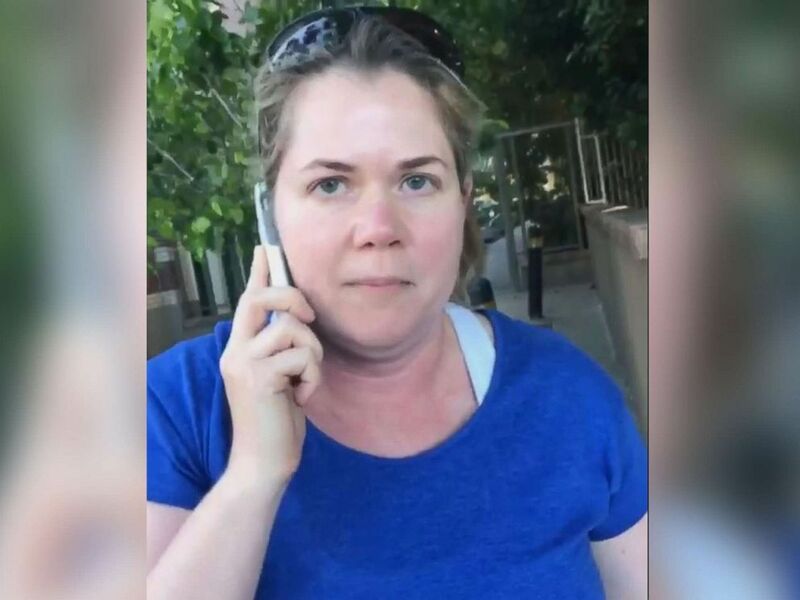 #permitpatty"
"She calls the cops on a little girl selling water but she's a drug dealer," wrote Yelp user Ikey P. who hails from Oakland. "Worse, she deals to dogs!!!"